I want to share my knowledge about how you can increase volume of headset, speaker, loudspeaker etc. after dial the some specific numbers(code) on dialer which enter into "Engineer Mode". Actually this trick is very easy to do, every even inexperienced can do it without any problems. 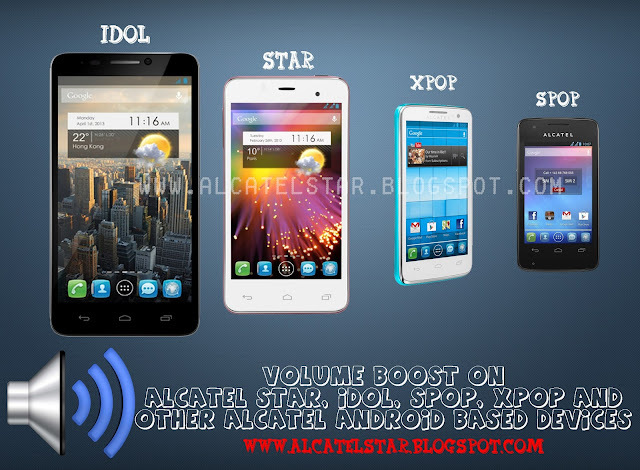 This trick is compatible with most Android based Alcatel One Touch models like Alcatel IDOL, Alcatel STAR, Alcatel SPOP, Alcatel IDOL Ultra and others. We [ALCATELSTAR.BLOGSPOT.COM] not resposible for any damage of your Androd(like bricking, corrupted/broken speakers headphnes) after using this tutorial. So for example, let's increase the volume for headphones of Music. Enter into "Headset mode" go to "Type" drop-down menu and select Media(for FmRadio is FMR). Then go to "Level" and select Level 6(it means that the latter level when the goal of increasing and decreasing the sound of Vol +/- buttons). Now on "Value is 0~255" almost the end where is located and increase on my Alcatel STAR value is "128" increase with 10, 20, 30 but important remember don't increase to maximum risk to damage the speaker of Phone. As you see in the end there is another option with value "Max Vol.0~160" on my phone's 140(on other Alcatel phones may be different values) if my value at first option is at maximum you can increase and this but don't touch only in a pinch. I hope to understand you my long guide of increasing volume on Alcatel phone's. note: on Normal mode-> again for music is "Media". This is brilliant, thanks for info. I have Idol 6030 from t-mobile, and during power on/off there is so loud t-mobile intro music that freaks me out. Is there any chance to volume down that intro? - for removing go to /custpack/JRD_custres/audio/switch-on-off and delete/move inside files. - for disabling go to /custpack/build.prop edit file use Root browser or other look at line: "ro.config.key_switch_on_off=1" change to 0 "ro.config.key_switch_on_off=1". I hope I've helped to you! I want to know defaults engineering mode/audio settings for alcatel one touch 5022d.